Why is the day exactly 24 hours long? This has got to to be the best question so far, continuing in the questions for "evolutionists" series. It disappoints me such people don't even understand the shape and structure of the very local universe. Darwinists, if Intelligent Design isn't true, then why is a day exactly 24 hours long? If by Darwinist you mean biologists, then you're asking the wrong group of people. Try asking some astronomers. A (solar) day is 24 hours long because we decided to break a day up into 24 segments for the purposes of time keeping. We could have just as easily broken it into 10 hours, or 100 hours. Or even 54 hours! Nowadays however we know that a day isn't 24 hours long. A single day can vary by around 20 seconds depending on the location of the Earth along its orbit. When closer to the Sun near perihelion solar days become longer as the Earth is moving faster in its orbit and has to rotate further to bring the Sun back to the same position on the sky and vice versa. Over the course of a year it will average out to 24 hours, although due to the Moon the Earth's rotation is decelerating. There's also the sidereal day to take into account which is the time it takes the Earth to rotate relative to the stars. This is truest gauge of how long the Earth takes to rotate. And it is 23 hours 56 minutes and 4 seconds. Now if the sidereal and the solar day were the same, then maybe you could invoke an intelligent designer to explain why the Earth is a relatively nice place to live, as it would look a little different to how it is now, it would have either fallen into the Sun or remain in orbit with one side boiling and the other freezing while remaining tidally locked to the Sun. Also, the sun reaches its highest point at noon every day. Why do Darwinists claim this all happened by 'accident' and deny this evidence of intelligent Creator? The Earth rotates and is angled away from the Sun so it has be at its highest point at some time; we decided to call this the solar noon, which when the Sun crosses the meridian (an imaginary circle crossing between the poles angled at 90° to the local horizon). If by noon you mean 12:00 then this is false. In most countries solar noon will be sometime between 11:00 and 14:00 but due to how large time zones and the fact we like taking hours off and putting them on the solar noon and 12:00 are very rarely equal unless you're stood just in the right spot. Biologists don't claim this happened by accident. Neither do astronomers. The solar system is a product of the laws of nature. It wasn't put into place as-is by some supernatural intergalactic dictator; it developed from a cloud of hydrogen and dust over millions of years. It seems to be you like using arbitrary names or systems that we came up with to describe the universe as evidence of a designer. The only designer it is evidence for is ourselves. Continuing the long series on questions for "evolutionists" is a few questions from a reader I got. I assume they think their questions are compelling. They are not. What came first, the chicken or the egg? If the egg; what came first, the embryo or the shell? The egg came first. Let me explain why. At some point in the chicken’s evolutionary past, it was a different species. Scientists categorise modern domesticated chickens as Gallus gallus domesticus. Their domestication is estimated to have started around 10,000 years ago in East Asia. If we for the sake of argument define chickens or red junglefowl (Gallus gallus) as a different species at a point around 10,000 years ago when they started to become domesticated, there would have been a a time where a chicken's parents were just those wild red junglefowls. Of course from individual generations the differences are only slight. But differences do occur. Broadening the concept further, all birds are descended from dinosaurs, so at some point dinosaurs did lay eggs with birds in them. Obviously it's not as such fine a line and species change gradually, but if you have to draw a razor sharp line somewhere, it will fall between two generations. A quick point on what came first out of shell or an embryo. An embryo, which is critical to a species reproducing, would have come first. You can reproduce without a shell, as many species do and have done in the past. If you evolve a shell and it helps you survive, bonus. But it's certainly not the first step. What came first DNA or the proteins that make up DNA? Since DNA itself contains the code or instructions on how to make more DNA? First up DNA is not made from proteins, DNA codes for proteins, you can think of proteins as carrying out all the jobs that need to be done in a cell, and DNA as what tells the proteins what to do. Proteins would have *probably* been around before DNA; however this is obviously cutting edge science, and without a time machine it will be difficult to determine. It's probably fair to say RNA and proteins co-evolved. Although the first life on Earth would probably have been a simple self-replicated module, similar to RNA. 1. Google: "how old is mount everest"
2. Google: "how many inches does mount everest grow in one year". 5. Mount everest should be 31,818 miles high? Very nice. But the Earth cannot be understood by such simple arithmetic. You also need to consider the different rates Mt Everest and the Himalayas would have been growing, or shrinking over the course of the last 70 million years. You also need to take into account the amount of erosion that would have been happening over the course of those 70 million or so years, and take into account its variability also. Lastly, you also need to take into account that mountains cannot get much bigger than Mt Everest because gravity will pull them down, essentially they'll shrink under their own weight. An asteroid can have a huge lump or mountain out of one side, but an object as massive as the Earth has a lot of gravity and it will tend to smooth itself out. Continuing in the questions for "evolutionists" series. How do evolutionists resolve the problem of galaxies and stars being billion of lights years away from Earth? When the universe is only six thousand years old? Simple, the universe is not 6000 years old. The universe is 13.73 (+/- .12) billion years old. Most christians don't believe that, most won't even know what you're even talking about. Your creationist videos/books have come up with this excuse for how objects can be billion of light years away in a 6000 year old universe and be visible. What about for you evolutionists? What is the naturalistic explanation for how these stars are so far away in a six thousand year old universe? Well its really not a question for "evolutionists", ignoring your poor attempt to associate biology and science with an ideology, biologists study life on Earth, not the universe. Cosmologists and astronomers study the universe. As for the answer it's simple, your basic premise is wrong. The age of the universe is greater than 6000 years. How do Darwinists? explain the cambrian explosion? i know there isnt a logical explaination but it kinda points toward creation doesnt it? First of all, using the term Darwinist, like evolutionist is a tactical ploy on behalf of the creationists. They intend to imply that acceptance of the evidence is equivalent to an ideology, like their own creationism. It's not, it's a science. However it does have its benefits, you know when you're talking to some kind of creationist or evolution denier because they almost exclusively use this sort of language. Anyway to get to Mike's point or more accurately the point he's repeating from some creationist website, which falsely implies the Cambrian explosion is a problem for biologists. The Cambrian explosion, unlike its name suggests wasn't an explosion and it certainly wasn't a fast explosion. It refers to a period of about 50 million years over which we see an increasing number of species in the fossil record. Such as increasing oxygen in the Earth's atmosphere, the Earth's early atmosphere contained no free oxygen, all the oxygen in the atmosphere is produced by photosynthesis and this has been steadily increasing over billions of years. Or an earlier extinction event such as the Ediacaran mass extinction. Life often rebounds with relatively rapid diversification after an extinction event to fill all the available niches. Just look out how mammals have diversified after the extinction of the dinosaurs. 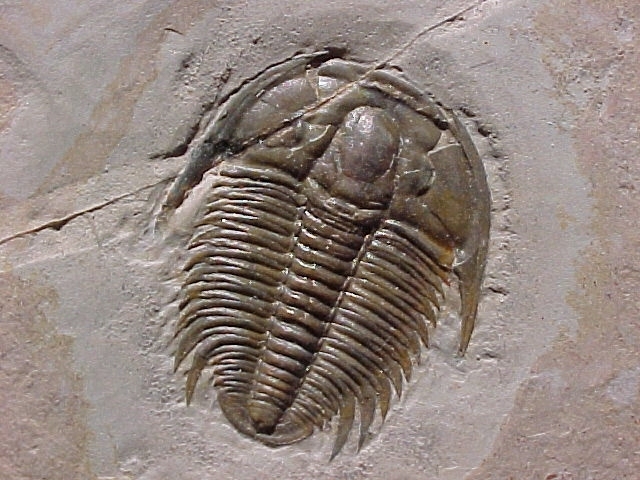 The evolution of skeletons, many species in the pre-Cambrian were soft bodied creatures, in the Cambrian we start to see increasing numbers of creatures with exoskeletons like trilobites (pictured below), this could be due to increasing numbers of animals with hard parts, but it can also simply be an artefact of fossilisation - animals like trilobites fossilise much easier than animals like jellyfish, simply because of their skeletons. Or something simple like increasing size of planktonic animals, which being larger would have fallen faster to the sea floor when they died could have opened up all new niches deeper in the oceans, which life diversified to fill. And so on. In science very rarely is one thing the answer, its often a combination of multiple things working together. 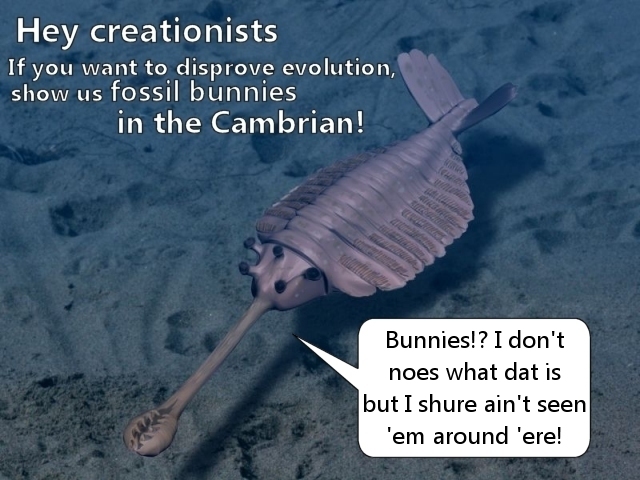 The Cambrian explosion certainly isn't evidence for a biblical 6 day creation like you imply. Sorry Mike, you're wrong. Dead wrong. There was multi-cellular life before the Cambrian, most if not all of it was soft-bodied, like jellyfish and worms. Lastly, fossils of *almost* every species known to man? Do you even know what life was alive in the Cambrian? Obviously not as you're trying to imply that all animals and plants suddenly appeared in the Cambrian, they didn't. No animal or plant you'd recognise today was alive in the Cambrian, there were no land animals, no land plants, all life was in the oceans. What we do find are animals like trilobites and opabinia as shown below. Another question from those crazy creationists. Evolutionist: What colour was the skin of the first human? So why are some races made different varieties of colours? Is there a reason for this? Yes, we call it evolution. Homo sapiens originated in east Africa around 200,000 years ago. By about 70,000 years ago the human population is estimated to be around 2000 to 5000 individuals. From those about 150 people crossed the Red Sea and went on to inhabit the rest of the world, Asians branched first, settling in southern Asia by about 60,000 years ago, later reaching east Asia by about 30,000 years ago, Europeans branched off the older Asian populations settling in Europe around 50,000 years ago, with members from northern and eastern Asia settling in the Americas between 30,000 and 10,000 years ago. Because the populations were isolated, any new genetic information couldn't be exchanged between them, resulting in the variation we see today. If we were isolated for a couple of million years longer the changes would have gradually built up until we were all different species.